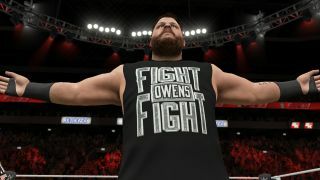 On Wednesday GR+ reported that a WWE 2K17 patch was on the way to fix a bug which can wipe user save data – and sure enough, it's now live on both PS4 and Xbox One. Another welcome fix for those who play Universe mode is the ability to switch between tag partners during any match, while it's also now possible to edit a title match into any given show without the game adding an extra random bout to the card. I spent yesterday evening testing the patch and it mostly works as described – for instance, Bayley's entrance is much improved by the fact that the crowd actually cheers on cue. However, there is one frustration it's brought on: custom logos applied to already-downloaded creations seem to have completely disappeared, meaning I'll need to re-download them all from scratch. If you had, say, 30 or more wrestlers downloaded pre-patch, that's going to be a grind. The patch also adds support for the upcoming Legends DLC pack, featuring Eddie Guerrero, Tatanka, Sycho Sid, Brutus Beefcake, and Greg 'The Hammer' Valentine. No release date for that is given as yet.